The adventurous Moon in Sagittarius loves to take a gamble and is certain that the adventurous life must be embraced. A blunt personality will form, however, and you cannot take some people too seriously once you have pierced the veil that separates casual and intimate. You have to have it all or you simply do not want even a taste. A soulmate search is successful, perhaps even a few times in your life! Moon in Sagittarius is a time, when lunar sky path is crossing the ninth sector of the zodiac - between ∠240°-270°, where is located the constellation of Sagittarius. 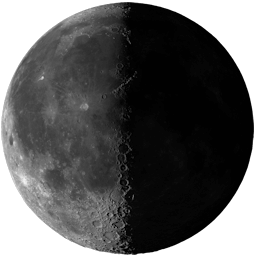 Waxing Moon visits Sagittarius zodiac sign only in the period from June to December and Waning Moon transits Sagittarius only from December to June. New Moon and Full Moon in Sagittarius is a time to benefit of fresh information and new ideas. When the other speaks, try to listen and understand, what is the important. New Moon in Sagittarius may occur only in the end of November and in the beginning of December, when the Sun is in Sagittarius zodiac sign too. Full Moon in Sagittarius may happen only in the end of May and in the beginning of June, when the Sun moves in Gemini, the zodiac sector opposite to Sagittarius. More than anything, Lunar Sagittarians have a need for personal freedom and space. They are extraordinarily happy and easygoing folk, as long as they don’t feel caged in or cooped up. Lunar Sagittarians have a simultaneous need for activity. Meeting new people, going out in the world, and travel are all important to their sense of well-being. They love open spaces, and, in their homes, a roomy and bright environment. There’s a bit of a teacher in Moon in Sagittarius, and definitely a helpful spirit. They easily forget appointments and the like, and some are even considered irresponsible. However, it is hard to stay angry at a Lunar Sagittarian! They are so cheerful and upbeat, and their optimism is catchy. Many people with this position are outdoorsy types. At the very least, they have a great love for friendly competition. When the going gets tough, these people run away. They don’t like to be caught up in routine for too long, and they simply need to escape. There’s a blind faith in Lunar Sagittarians that is admirable. They simply believe that everything will work out. Not much for making detailed plans, people with Moon in Sagittarius prefer to wing it. They’re very adaptable and generally on the go.